Note: I did this on the SL-5500 with Sharp's official ROM version 3.10. The same procedure may or may not work on other Linux-arm based PDAs. If you try it on other platforms, please do let me know the result! You can contact me at aztarac at gmx dot de. PS: Take note that SHARP made available the ROM source code since this was written. It is downloadable under the GPL license. Many people love Sharp's line of Zaurus PDAs for their superior hardware. 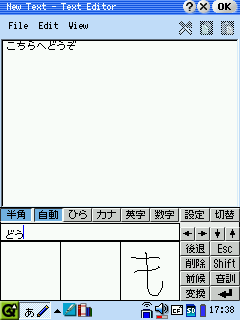 But Sharp not only makes good hardware they also wrote some of the best Japanese handwriting recognition software. Unfortunately, it's not included in the European and US models. So here is a description how to enable Japanese handwriting recognition on the Zaurus SL-5500. Please also check Ichiya Kamiki's site where I got most of the information from. The general procedure is to take the files which are needed for Japanese input from the ROM of a Japanese Zaurus and install them on your SL-5500. The Japanese Zaurus can be a physical machine or you can mount a ROM image which is intended for ROM updates of a A300 or other Japanese models. The second variant is described here. Now go to /mountpoint and transfer all relevant files from the desktop to your Zaurus. I store them on SD but you could also use CF (/mnt/cf/opt/QtPalmtop) or even RAM (/home/QtPalmtop). They are more than 4 MBytes though. | ssh root@zaurus "(cd /mnt/card/opt/QtPalmtop; tar xzf -)"
Obviously you need sshd to be installed on your Zaurus and a network connection for this to work. Another way would be to create a tarball with the files and transfer that by other means to the Zaurus. Opie users may have to include lib/libsl*. If you installed the files in RAM (/home/QtPalmtop), then you got all you need. Otherwise you have to create a couple of links on your Zaurus. Here is a shellscript to do this for you. Don't forget to change INSTDIR if your files are not in /mnt/card/opt/QtPalmtop and su to root before running it from a shell. Once all necessary links are created you just have to reboot and enjoy your new input method. If you see only squares instead of kanji you need to install fonts with Japanese characters. In some cases the Japanese input method disappears from the list. This happened to me after the installation of some other packages. In this case a reboot usually helps. The next steps are done on the Zaurus in the terminal (as root!). Then you just create the links as described above. ...Now how about folks who don't have a Linux box? I'm sure there are programs which can handle tar and bz2 on OSX. - transfer all.nb0 to SD or CF and insert the card into your zaurus. The next steps are done on the Zaurus in the terminal. | "(cd /mnt/card/opt/QtPalmtop; tar xzf -)"
> know if these are the only files needed. Japanese Zaurus to figure out which files are needed.